What’s Self-Care + Self-Improvement + a Close-Knit Community? The Calm Collective! If you’re a woman who is not only looking for her tribe, but also wants to feel less reactive to the world, more solid in her boundaries, and more present, calm and joyful in her life, then I invite you to join The Calm Collective in Sacramento, CA. Little things all add up to big results. All month long, I’ve been talking about why it’s important to put yourself first and prioritize your relationship. 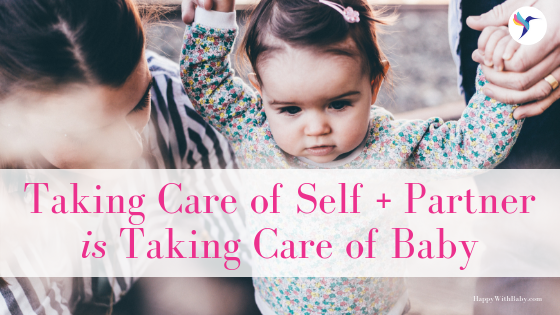 It sounds counterintuitive or even unnatural when you say it out loud, but doing those two things first makes taking care of baby so much easier. It’s really worth a try. Something I hear many moms say is that they worry about whether they’re doing this parenting thing right. Well, in my opinion, if you’re worried about it, that’s a good indicator that you’re doing just fine. And guess what supports a momma who is self-reflective and always strives to do better? Now, let’s review how we make that happen. Scroll down to watch the video or read the transcript. Hi, I'm Catherine O'Brien at HappyWithBaby.com and in the spirit of setting intentions this year, I've been talking all month about how it is important for us to do the small things everyday for ourselves for our partners, and in turn it benefits our baby and our children. I often hear from parents that they're worried [whether] they're doing everything right. And my thing that I often tell them is that if they're worried about it, they probably are. Now are there things that we could do differently. Do we make mistakes? Absolutely. But if you're thinking about it, and worried about it, and you keep making adjustments to try to do things better, then you're doing things the right way. There's this need to keep giving to our children and getting them more things and doing more and more for them, but the thing is is to remember, it's those small moments that we're spending with them and interacting with them and being present. So a lot of what I've talked about all month is how we need to take care of ourselves and our partners and the ways that we can do that. And this goes for whether you're divorced or separated or whatever. Your relationship does make a difference for your children. So if mom isn't okay, then it definitely will affect your child's development. So that's why it's so important that you stop and do the small things for yourself all the time, often. So let's recap from all the lessons of the month. #1 Take care of ourselves first and foremost. Again, "small things often". Make sure you're prioritizing the basics, right. Morning and bedtime routines and hygiene for yourself, asking yourself what you need in this moment and doing your best to meet yourself there, and forgiving yourself for doing things imperfectly (because you will do things imperfectly). #2 Take care of your connection with your partner. Make sure you're doing your weekly check-ins with each other, honor each other's roles in parenting and in running the household, and ask for help where and when you need it. Model the good communication and problem-solving for your kids. Even when they're very young, they pick up on everything. Babies and kids pick up on more than we think. And above all, make time to enjoy each other. There is a reason you got into this together in the first place, right? And the reason needs nurturing just like anything else we do. #3 Re-evaluate where you really do have a choice. How can you reclaim your time for the things that really matter to you? Let go of what is no longer important or providing value to you and ask for the help that you want. Don't wait for someone else to notice you need help. #4 Remember how much easier taking care of baby and enjoying your time with baby is when all those other things are taken care of first. Watch them thrive when they are loved and cared for by two happy, healthy and well-supported parents. And if you've been following me on Instagram, you guys, it's not too late to join my Instagram challenge #MomComesFirst. I would love for you to post at least one photo per day or even one photo of yourself doing something for you and use the #MomComesFirst. So tag me @happywithbaby so I can cheer you on and search the hashtag for inspiration. So until next time, you guys, take care. What’s Self-Care + Self-Improvement + a Close-Knit Community? Hurry and reserve your spot! Our next meeting is on Wed., Feb. 20!